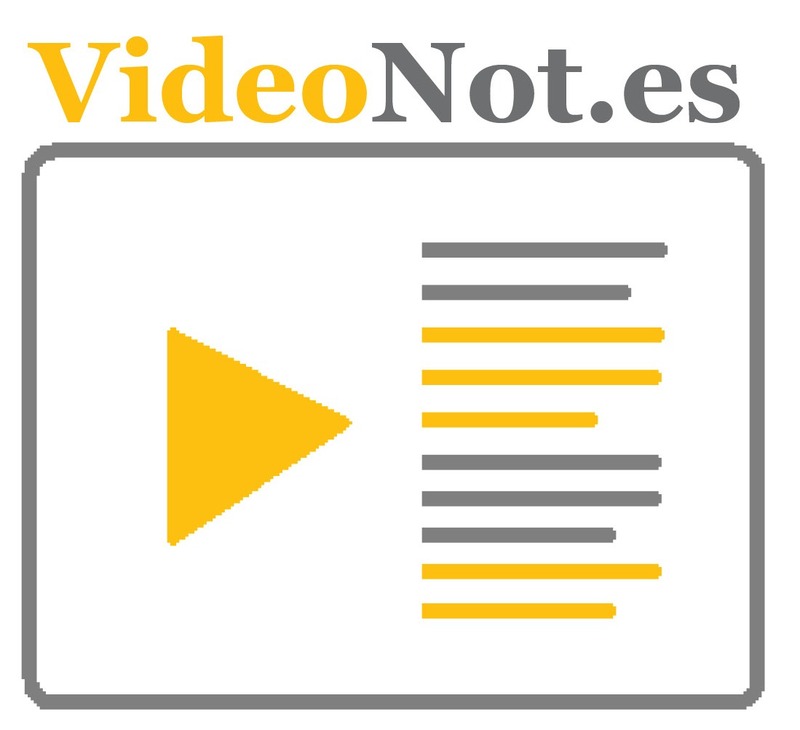 VideoNot.es is a tool that allows you to take synchronized notes while watching a video. It is a web-based tool that works well for multiple video sites, such as YouTube, Vimeo, Khan Academy, edX, Udacity, and Coursera. VideoNot.es is synchronized with Google Drive, which means all notes are automatically saved as Google Docs in your Drive. Since the notes are saved in Google Drive, users need a Google account to use VideoNot.es. Students can use this tool to record their thoughts and ideas about a particular video to share with their peers and teachers. Teacher can use VideoNot.es as an summative or formative assessment tool to review students thoughts about specific content. Ease of Use: VideoNot.es is very easy to use.Users only need to copy and paste a video link into the box on the left side of their screen and enter their notes on the right side while playing the video. They can play or pause the video as needed. It is also easy for them to share the notes with others via Google Drive. Technical support is available on the lower-right corner of the screen. Users can search for help articles or contact customer support via email. The step-by-step tutorials are offered when the user first log in to VideoNot.es. Privacy: VideoNot. es will need users’ permission to view basic information from Google (email, name, Google profile) in order to identify users. Although Video notes can be saved in Google Drive, the VideoNot.es server won’t access other files in your Google Drive. VideoNot.es is a tool that allows you to take synchronized notes while watching a video. It is a web-based App that works well for multiple video sites. 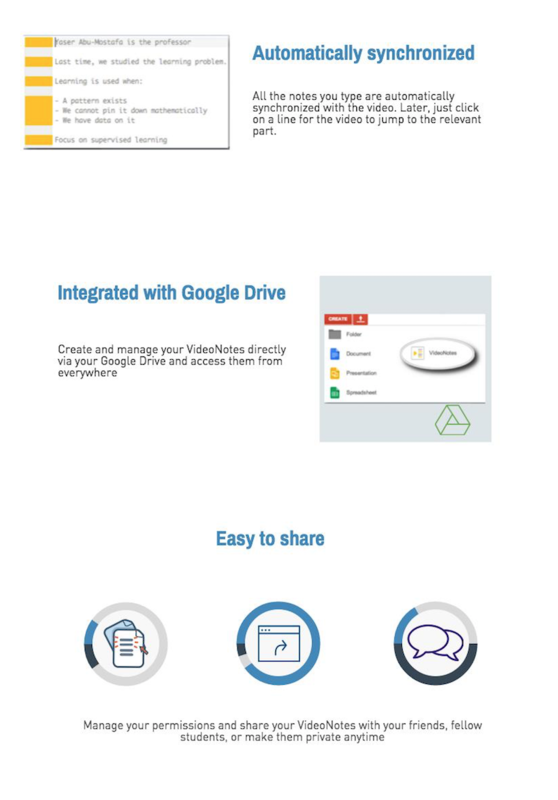 VideoNot.es is Integrated with Google Drive, you can Create and manage your VideoNotes directly via your Google Drive and access them from everywhere. You can Manage your permissions and share your VideoNotes with your friends, fellow students, or make them private anytime. Substitution: Students can take notes while watching a video directly on the screen instead of using traditional pen and paper. Augmentation: Students can stop & play (replay) the video as needed. They also can edit, store and retrieve their notes at anytime. Modification: Teachers can use VideoNot.es to provide feedback for videos created by students. Redefinition: Students can share their video notes with their peers and teachers, receive immediate feedback, and compare and contrast other students’ notes in real time. Listening is an important component for second language learners. Students can use VideoNot.es to transcribe a video (e.g., write down the key words or full sentences of the oral presentations in the video). Teachers can use VideoNot.es to provide feedback to student video productions either as an formative assessment or summartive assessment. Also, teachers can encourage students to comment on each others’ videos, so that they can improve their work. They can collaboratively comment on research resources in video format (eg. Ed Talk, 60 second science), make comment or annotations about the evidence that how does it related to their research project. Analyzing Educational Videos – Use Mayer’s Multimedia Design principles to evaluate an educational video. For this activity, find an educational video from Vimeo or YouTube. Then, use VideoNot.es to make specific notes on the video. In your notes, highlight where the video does or does not follow the design theories and principles that you have just learned. Also, describe how you might improve the video. Click “Load Video” button. The video will be loaded on the left screen. Also you can click the “Change video” button to load another video. You can play and stop the video and in the same time, you can enter the notes on the right screen. Press “Enter” button to jump to the next line. Video and notes are automatically saved in your Google Drive. Click “Share” Button on the upper-right corner to share the link of video notes with others. Mu, X. (2010). Towards effective video annotation: An approach to automatically link notes with video content. Computers & Education, 55(4), 1752-1763.